ESO Supernova Exhibition — What is a planet? Two types of planet orbit the Sun: small, rocky worlds and large giants of gas and ice. Objects orbiting the planets are called moons. There are also many smaller bodies in the Solar System, which are harder to classify. Rocky worlds: The four terrestrial planets, shown to scale. All four have cores of iron and nickel, and thick mantles of silicate rock. Venus and Earth are the only two with significant atmospheres; and Earth is the only one with liquid surface water. Gaseous giants. The four giant planets, shown to scale. Jupiter and Saturn are mainly hydrogen and helium; Uranus and Neptune contain large amounts of heavier elements. All four have ring systems, the most impressive of which is Saturn’s. A planet is an object which orbits a star, and which is massive enough to have become rounded by its own gravity. It must also have cleared most of the debris from its path around the star. In our Solar System, the inner four planets are small and consist of metals and rocks. The outer four are larger and mainly composed of hydrogen and helium. Pluto is an example of a dwarf planet: massive enough to have become spherical but not massive enough to have gravitationally cleared its own orbit. Even smaller bodies are classified as asteroids, comets, or Kuiper Belt objects, but the distinctions between these categories are not well- defined. 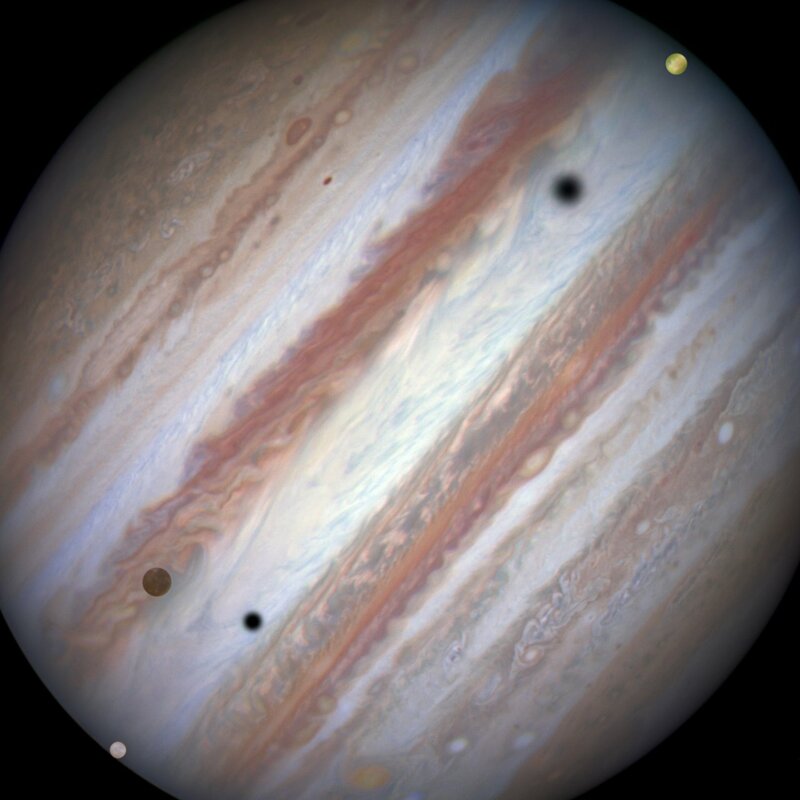 Moon business: Jupiter’s largest moons cast dark shadows on its turbulent atmosphere. Some planetary satellites are larger than the planet Mercury, but since they orbit a planet, they’re classified as moons. On a beach you find lots of different stones. Some you might call pebbles, others you might call rocks. But how do you tell when something should be called a pebble or when it should be called a rock? Defining planets is almost as hard!